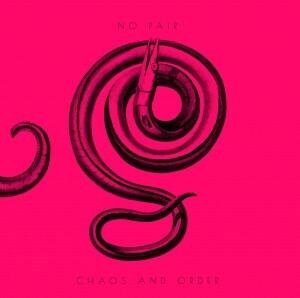 No Pair, an Italian jazz-rock improv group came to me as a recommendation, and brilliant one it was. I've had the album in high rotation now for the past six weeks or so that it has been in my grimy paws, never tiring of its loose and fragmented ferocity. It's one of those rare albums that catches on the first spin and doesn't let go. A bit hyperbolic, I know, but let me explain. Chaos and Order is the work of Francesco Chiapperini who composes and plays bass and soprano clarinet. He is joined by Gianluca Elia on tenor sax, Dario Trapani on electric guitar and Antonio Fusco on drums. To make any comparisons, I'd post that there are strong traces of Lucien Dubius' looping bass heavy songs and even a bit of Marc Ribot's style in the guitar playing. Some of the writing, like on 'Brain Misty' even has hints of Bundle's era Soft Machine with it's mix of horn arrangements, analog electronic sounds and biting guitar work. In fact, I think the group enjoyed playing that one so much they didn't know how to stop - so it simply ends with an acute fade. The album kicks off with 'Edag' which begins like a steamroller, gives way to a solo clarinet passage that twirls around until leading back into the power chords and a dance of the woodwinds. It's scripted for sure, it's so precise, but it's also loose and jangly. The follow up 10 minute 'Sliding Snickers' starts starkly different, shape shifting snippets snake stealthily around a implied pulse. You're halfway through already before the pieces come together - fast - and then fall apart just as fast. The ironically playful 'Spreadsheet' is vivacious and fun, as Chiapperini's clarinet work shines through clear and delightful. The skeletal groove of guitar, sax and drum makes for tenuous and lovely support. I've had Chaos and Order with me in the car, on a jog, on the train and blasting through the house. What can I say, it sounds great everywhere. The quartet draws deep from the well of rock and jazz and comes up with something fresh. Available through Downtown Music Gallery.